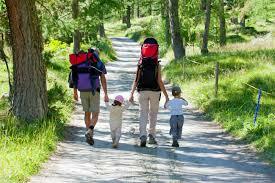 Home Family Hiking Hiking with Kids – an age by age guide. Hiking as a family is a great way to connect to your children at any age. Time spent in nature is good for the body, mind and spirit and brings people together in a very special way. Always remember: kids aren’t as resilient as adults, they’ll enjoy their time a lot more if they are kept warm, dry, hydrated, and full. Bring trail friendly snacks; trail mix, crackers, granola bars, etc.. Hiking with a toddler? Definitely! REI Co-op has put together a fabulous guide for hiking with your children at all ages and stages.